Hey there. Who loves romantic comedies of the zombie variety? If you were one of those that yelled out, "ME! ME! ", then you are in luck! 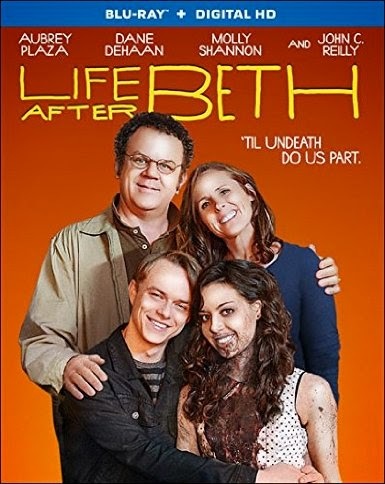 The film, Life After Beth, has all that plus Molly Shannon and John C. Reilly! And guess what, I've teamed up with our good friends at Film Book to give the opportunity to one of you fine readers to win this film on Blu Ray! Before we get into the giveaway details, here's a synopsis of the film. Zach is devastated by the unexpected death of his girlfriend, Beth. Miraculously, she comes back to life and Zach takes full advantage of the opportunity to do all the things that he regretted not doing while Beth was alive. However, something is quite not right with Beth and she is not the way Zach remembers. Before he knows it, Zach's world takes a turn for the worse. So what do you think of zombie movies? Which is your favorite zombie flick? Let's hear it in the comments, friends! And good luck!! !